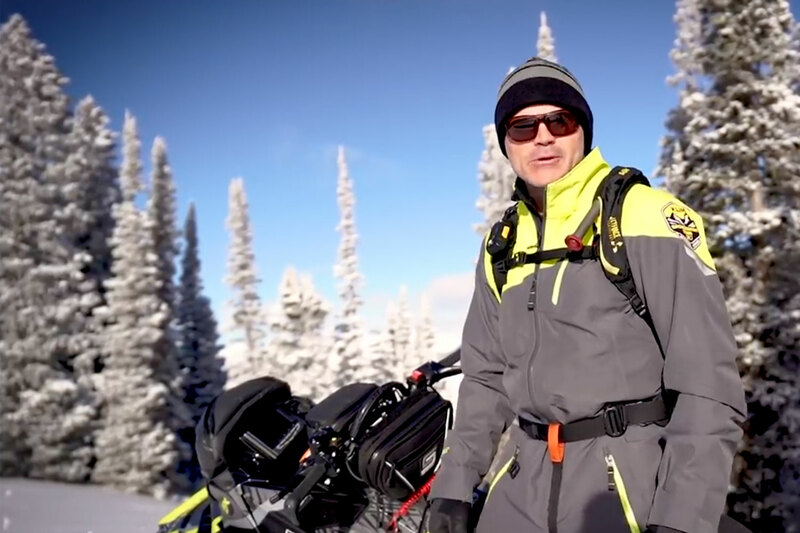 In North American snowmobiling, a few destinations are legendary, their mystique spread through social media and word of mouth. One is the Quebec Maritime Region called Gaspésie. Also known as the Gaspé Peninsula, it's bounded in the north by the Gulf of St. Lawrence, the east by the Atlantic Ocean, and south by the Bay of Chaleur (with a great view of New Brunswick from the lookout above the town of Point-à-La-Croix). Gaspésie boasts oodles of snow, plus a sledding season that starts early and lasts well into April. This bucket list Canadian destination also delivers breathtaking scenery, panoramic lookouts and a superb network of wide, sweeping trails that may be the best you’ll ever ride day after day. Typically tabletop smooth with minimal traffic, these snow corridors also provide good access to English speaking services and amenities. 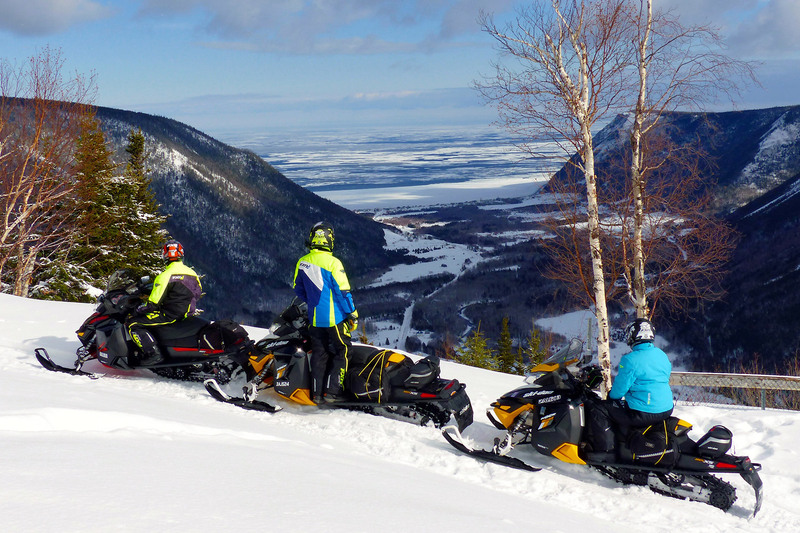 If powder riding's your thing, connect with one of the boondocking outfits located in the Chic-Chocs, part of the northern Notre Dame Mountains (Aventure Chic-Chocs Mountain Riding). Frankly, I've never figured out how to do all this in a one-week trip. To get on the snow sooner, our self-guided saddlebag tour launched from Hotel Universel in Rivière-du-Loup. It’s located in the Gaspésie's neighbouring western region, Bas-Saint Laurent. We returned five days later after racking up 1,800 kilometres (1,118 miles). First, we rode a mountainous Trail 587 through the Matapedia Valley, then picked up the Trail 5 loop counter clockwise along the south coast from Point-à-La-Croix east to the town of Percé (check out the famous Percé Rock and the Mont-Saint-Anne lookout behind the town church). Going this direction, the going gets progressively more steep and stunning, culminating along the north shore. Here, the best lookouts are between Petite-Vallée & Saint Madelaine, and again from Saint-Maxime-du-Mont-Louis & La Martre. You’ll experience some long, high climbs and sharp descents on this section of Trail 5, so be prepared for popping ears! Adding the equally alluring interior trail loops to this itinerary would tack on another couple of riding days to the five we completed. Considering the trailer drive to and from Gaspésie is a full day or more each way depending on where home base is, you're into at least a ten-day expedition to get it all done out of Rivière-du-Loup. One alternative to cram more into your visit is to trailer farther east 200 kilometres (125 miles) past Rivière-du-Loup to stage within Gaspésie from Matane. While lengthening the drive, this launching point knocks a total of 600 kilometres (372 miles) off the ride we did - effectively two days, mostly in Bas-Saint-Laurent - so you could use these two days for more Gaspésie exploring. Having visited Gaspésie multiple times, I should note that it's wise to allow a spare day or two for a snow bound layover. Massive storms can and do occur throughout the winter that temporarily bring all traffic - even mountain sleds - to a full stop until roads and trails are cleared again. Also worthwhile to know is that Trail 5 on the south coast generally doesn’t last as long as its northern counterpart, and that's when the interior trails provide excellent options. Finally, be prepared to be slammed by blustery winds in open areas along the north coast, and don't attempt Gaspésie without studs - or without a driver's side mirror affixed to your sled as required by Quebec law. That all said, a one-week Gaspésie tour will blow your mind even if you don't have time to do it all. But that's good news, because then you'll have to go back for more real soon!